Visitors and residents of Boston will find it hard to shop here without being directed to Newbury Street. However, when it takes hours to walk the entire thing amid the throngs of people gawking at the temptations in the likes of Burberry and Chanel, you might wonder if there is something decidedly more off the beaten path. While it has long been known as a dining hub, the South End is increasingly becoming a destination for some of the city’s best independent shops. The neighborhood is a calmer scene than its Back Bay sister and, if you’re staying at the Seaport, merely a single Silver Line transfer away. Step off the T at any of the stops along Washington Street between Berkeley and West Brookline, and you will find a plethora of ways to decimate your bank account. From the months of May to October, visitors flock to the SoWa Market off Harrison Avenue to pick up unique gifts from a number of vendors or something a bit more decadent at food trucks like Bon Me. The permanent galleries surrounding the market continue to make the South End a hub for art collectors across the city while Bobby From Boston is the go-to destination for men’s vintage fashion from the likes of Tom Ford, filmmakers, and locals just looking for unique additions to their wardrobe. If you head north of Washington, you will find yourself amid a sea of unique shopping enclaves. 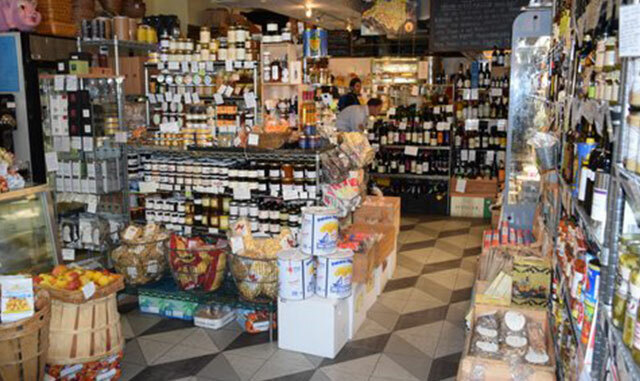 Foodies will find their Mecca behind the door of Formaggio on Shawmut Avenue. Exotic cheeses, artisanal gadgets, and special wines line the shelves at this market. Be sure to head to the back of the shop for some of the best sandwiches in town—if you can manage to get one before they sell out each day. Blocks away on Tremont Street is the wildly popular Olives and Grace. Featured by NBC News and winner of “Best Gifts” in Boston Magazine’s Best of Boston issue, owner Sofi Madison’s store is a hub for unique, small-batch goods. Arugula and basil candles, Jojo’s handcrafted sriracha from Brooklyn (our personal favorite! ), and cocktail glasses etched with maps of Boston are just a few of the items you can take home. While no trip to Boston is complete without a stroll up its iconic shopping street, it’s equally impressive to take a stroll through its increasingly iconic shopping neighborhood. Make a day of it to brunch and then enjoy looking for wares and fashion that you’re certain to not see anywhere else. Things here tend to be like the neighborhood itself: one-of-a-kind.